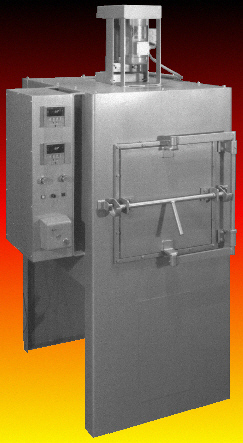 This series of LTG (Low Temperature Gas) Furnaces was designed for use in tool hardening shops and metallurgical technology laboratories for tempering, or drawing hardened parts or dies. It is also suitable for solution and precipitation treatment of aluminum and other non-ferrous alloys where extreme accuracy and clean atmospheres are required. Tempering operations do not exceed 1200° F and are below the red heat radiation range, therefore heat is transmitted to the furnace work load by CONVECTION (passing of heated air over the work load). The models LTG-1824 and LTG-1830 are radiant tube style furnaces where the burner is contained in a stainless steel tube and exhausted out the rear of the furnace. This keeps combustion by-products from being introduced into the work chamber, thereby providing a clean atmosphere for heat treating aluminum. LTG-1824 18Wx18H 18W-18H-24D 42W-77H-33D 18W-24L 240/480 3 42w x 33d 1,040 lbs. The furnaces are constructed of heavy steel, reinforced with structural members and welded for rigidity. 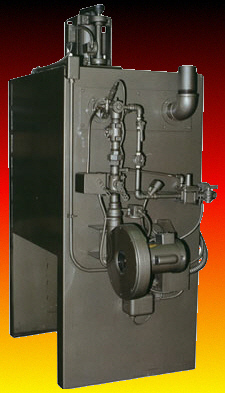 Simplified design permits quick removal or replacement of furnace components. The furnace top plate, including the fan assembly, can be removed to expose the heating tube and work chamber. The gas-fired radiant tube assembly bolts to the furnace back plate and can be removed easily for inspection or maintenance. The tube is heated by a proportioning gas/air burner that can be adjusted for any type of fuel gas. Automatic spark ignites the pilot which is continually monitored by an ultra-violet scanner. The air supply is controlled by a motorized butterfly air valve. The belt driven stainless steel circulating fan and fan shaft utilize standard self aligning pillow block bearings to assure long trouble free operation and to facilitate servicing. The motor is a standard “C” flange ball bearing motor with overload protection. The fan shaft heat slinger, mounted below the lower bearing, prevents excess shaft and bearing temperatures. The dual belt drive is protected by a sheet metal guard. On the larger units, a water cooled bearing system is utilized. Included with these units is a self contained coolant system that requires no water or drain lines be connected to the furnace. MIFCO furnishes an Ultra-Violet Control System that is activated by the ultra-violet rays emitted by a spark or flame. Ignition is automatic by high intensity spark at start up. In the event of flame failure, for any reason, the flame scanner closes the gas solenoid valve immediately and purges the system. Manual reset is then necessary to restart the furnace. Standard temperature control systems consist of digital readout, micro-processor based controllers mounted in a separate control panel. All control panels are completely wired, ready for immediate installation. Various programmable and recording instruments can be supplied. Some will require special control panels. Operating the LT Series Low Temperature Furnace, equipped with Automatic Temperature Control and the FM Combustion Safeguard System is extremely simple. Just press the start button on the control panel and enter the set point on the control instrument. Ignition and operation is completely automatic with maximum safety. The LTG Convection series is a tempering or drawing furnace with high velocity recirculating fan. It continually bathes the work load with evenly distributed, high velocity air, held to a constant temperature. Built to industrial standards, the furnace will meet the most critical metallurgical requirements for tool room or laboratory and has excellent temperature uniformity.